MicroRNAs (miRNAs) are 21- to 24-nucleotide (nt) RNAs that are the final products of nonprotein-coding genes. miRNAs are processed from single-stranded precursors that form hairpin structures, with the miRNAs residing in one arm of the stems. 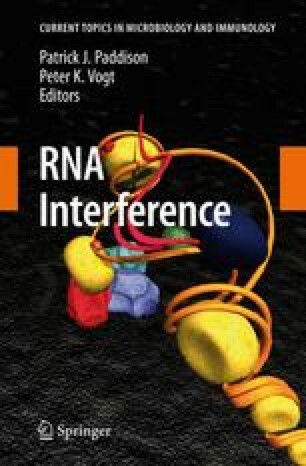 miRNAs were first isolated and recognized as regulators of protein-coding genes through forward genetic screens in Caenorhabditis elegans, but were not recognized as universal regulators of gene expression in animals until three landmark studies in year 2001 demonstrated the widespread existence of miRNAs in animals. Soon after, studies from a few groups identified a number of miRNAs from Arabidopsis, providing the first evidence for the existence of these regulatory molecules in plants. Since then, numerous miRNAs from a number of land plants ranging from mosses to flowering plants were identified, and functional studies in Arabidopsis established a framework of understanding of miRNA biogenesis and function. This chapter summarizes the current knowledge as well as gaps in our understanding of plant miRNA biogenesis and function.